A delightful gift to celebrate a special day of a little miracle and a happy new Mom. 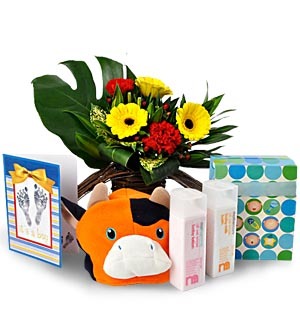 Mothercare Baby Bath Milk 300ml, Mothercare Baby Lotion 300ml, a matching Baby Moniker Cap, and a bouquet of Gerberas. Gift comes with a Personalized Tiny Footprints Congrats Card to pen your personal congratulatory message. Same-day delivery applies for delivery within Klang Valley. For outstation deliveries, fresh flowers will be replaced by silk pomander flowers, toys or other baby items. At least 3 days notice is required for outstation deliveries. Call +603-78830233 / +6012-6915200 or email sales@gift-lab.com for further assistance.